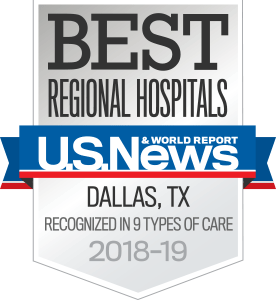 The specialists at the UT Southwestern Monty and Tex Moncrief Medical Center at Fort Worth provide expert care and effective treatments for all types of allergies, including allergic rhinitis. In addition to counseling patients about how they may be able to reduce their exposure to allergens through lifestyle changes, our specialists prescribe medications such as short-acting and long-acting antihistamines, nasal corticosteroids, decongestants, eye drops, and other drugs. We also offer comprehensive allergen skin testing, pulmonary-function testing, advanced anti-immunoglobulin (IgE) therapy, and drug desensitization therapy for patients who are allergic to medications necessary for their health. The clinic at Moncrief is unique due to its brand new, beautiful facility and the multiple specialties all offered at one location. With many specialists at the same location, we are able to collaborate and communicate about particularly difficult cases. Our goal is to deliver thoughtful, professional care to our patients by physicians and staff who are experts in their fields. By providing the best care possible, we can help patients achieve the quality of life they deserve. On the day of your appointment, please allow time for registration. Moncrief Medical Center has welcome kiosks and staff located at the main entrance to help you check in. Please bring your current insurance card, a method of payment (we accept checks or debit/credit cards only), and a complete list of current medications and dosages (including over-the-counter medications, herbs, and vitamins). To make the most of your time with the doctor, make a list of questions ahead of time and bring them to your appointment. If you need to cancel your appointment, please notify the clinic at least 24 hours in advance so that we can accommodate other patients waiting to schedule an appointment. For your convenience, there is a retail pharmacy in the Moncrief Medical Center. It is very important that you do not run out of your medication. Be sure that you have sufficient refills to last until your next appointment with your allergist. We are happy to provide you with a written prescription upon request. If you run out of refills, please call your pharmacy and your pharmacist will fax a refill request to us. Please allow us 24 to 48 hours to process refill requests.